Although neural network models have had a dramatic impact on the cognitive and brain sciences, social psychology has remained largely unaffected by this intellectual explosion. The first to apply neural network models to social phenomena, this book includes chapters by nearly all of the individuals currently working in this area. Bringing these various approaches together in one place, it allows readers to appreciate the breadth of these approaches, as well as the theoretical commonality of many of these models. The contributors address a number of central issues in social psychology and show how these kinds of models provide insight into many classic issues. Many chapters hint that this approach provides the seeds of a theoretical integration that the field has lacked. 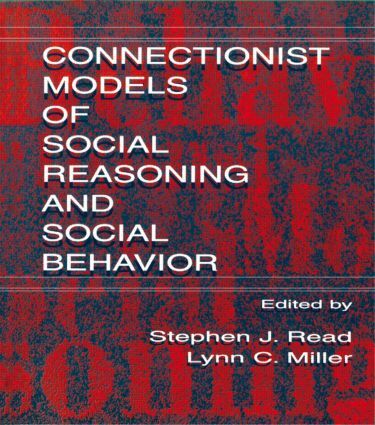 Each chapter discusses an explicit connectionist model of a central problem in social psychology. Since many of the contributors either use a standard architecture or provide a computer program, interested readers, with a little work, should be able to implement their own variations of models. * belief change and the coherence of large scale belief systems. "On the whole, this book is a good 'first of its kind' in the field of social psychology. The main strong point is that it brings the data in the field to computational models. In places, these models are almost as good as the Rumelhart and McClelland classics in terms of their explanatory power." Contents: Preface. Part I: Person Perception and Impression Formation. P. Thagard, Z. Kunda, Making Sense of People: Coherence Mechanisms. S.J. Read, L.C. Miller, On the Dynamic Construction of Meaning: An Interactive Activation and Competition Model of Social Perception. Part II: Stereotyping and Social Categorization. Y. Kashima, J. Woolcock, D. King, The Dynamics of Group Impression Formation: The Tensor Product Model of Exemplar-Based Social Category Learning. E.R. Smith, J. DeCoster, Person Perception and Stereotyping: Simulation Using Distributed Representations in a Recurrent Connectionist Network. Part III: Causal Reasoning. F. Van Overwalle, D. Van Rooy, A Connectionist Approach to Causal Attribution. Part IV: Personality and Behavior. Y. Shoda, W. Mischel, Personality as a Stable Cognitive-Affective Activation Network: Characteristic Patterns of Behavior Variation Emerge From a Stable Personality Structure. Part V: Attitudes and Beliefs. T.R. Shultz, M.R. Lepper, The Consonance Model of Dissonance Reduction. M. Ranney, P. Schank, Toward an Integration of the Social and the Scientific: Observing, Modeling, and Promoting the Explanatory Coherence of Reasoning. Part VI: Social Influence and Group Interaction. A. Nowak, R.R. Vallacher, Toward Computational Social Psychology: Cellular Automata and Neural Network Models of Interpersonal Dynamics. J.R. Eiser, M.J.A. Claessen, J.J. Loose, Attitudes, Beliefs, and Other Minds: Shared Representations in Self-Organizing Systems.